Featherweight Vasyl Lomachenko led the charge last night in Carson, CA, getting it right the second time around in his bid for a world title in just his third professional bout, outpointing contender Gary Russel Jr via majority decision to capture the vacant WBO belt at StubHub Center. The pair's clash highlighted a lineup punctuated by top southpaw fighters all making successful comebacks from world title fight losses. Lomachenko, 2-1 (1), who lost a WBO feather opportunity against Orlando Salido last time out, proved to be too big, too mobile and too crafty for Russell, 24-1 (14), who fought back gamely but wasn't as accurate as the Ukrainian. A big part of that was the tricky defense of Lomachenko, who negated much of what Russell threw with quick footwork and good head movement. Lomachenko never seemed to rest for a second as he was constantly in motion. Russell had trouble coping when Lomachenko came forward as the former two time Olympic gold medallist presented endless offensive variety in his combinations to the head and body. After 12 rounds, Lomachenko won two of the cards by scores of 116-112 with the third coming in at 114-114. Welterweight Robert Guerrero, 32-2-1 (18), came back from a failed WBC title bid against Floyd Mayweather Jr last year, tangling with Japan's OPBF champ Yoshihiro Kamegai, 24-2-1 (21). Guerrero may have intended to display an improved boxing ability going into the bout but once he got hit in the first round he got right in the trenches and brawled for 12 rounds with the taller visitor. This gave the less experienced and more limited Kamegai an opportunity to be competitive, resulting in a spectacular firefight with countless give and take exchanges. Both men were bruised and battered after 12 rounds with Guerrero sweeping the cards on scores of 117-111, 117-111 and 116-112. The granite-jawed Guerrero absorbed a hail of unnecessary punishment as he likely could have outboxed his rival and at 31 years of age, blocking punches with his face is probably not the key to career longevity. But, that massive fighting spirit is what has allowed the Californian to successfully come up through five divisions, winning world titles at featherweight and super featherweight and Interim belts at lightweight and welterweight. Also on the card in Carson, former light welter and welter world titlist Devon Alexander, 26-2 (14), who lost the IBF welter crown to Shawn Porter in his previous outing, made a successful return. 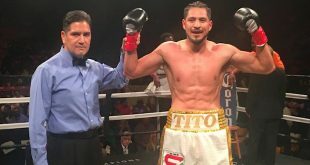 Alexander made the jump to light middle, outboxing veteran Jesus Soto Karass, 28-10-3 (18), in an all-action contest on scores of 99-91, 99-91 and 97-93. Soto Karass was the busier fighter but the Mexican couldn't take advantage of his edge in strength and size as Alexander was simply too quick and accurate. 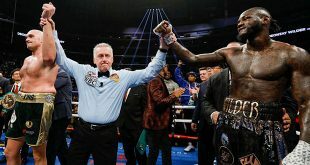 Former light world champ Chad Dawson, 32-3 (18), sat out a year after getting stopped by both Andre Ward and Adonis Stevenson, coming back to KO 39 year old veteran George Blades, 23-5 (16), in the first round. While a win is a win, the victory isn't much of an indicator of the future prospects of Dawson as the outgunned Blades had only fought five times over the last seven years, going 2-3, with all the losses inside the distance. Can Dawson mount a serious comeback against top level competition? 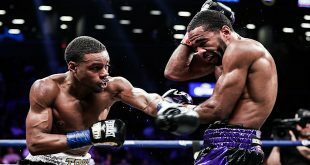 A trip north to rematch Jean Pascal, who defeated Dawson in 2010, should provide "Bad Chad" with a real litmus test and the motivation to gain revenge on a rival.